Jimbot is debuting his first Wood Robots exclusively at C2E2 in Chicago this weekend (4.25-4.27). 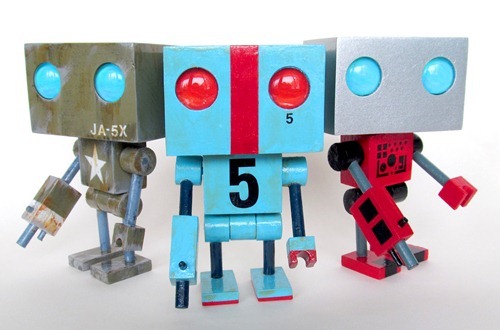 He’s created a total of nine ‘bots for the ‘con in three colorways (olive green military, blue + red, and red + silver). The 5.25” figure feature three points of articulation (neck and shoulders), have glass eyes, include a print, 2 stickers, and an official signed/numbered ‘JIMBOT Wood Robot’ card. The bot comes wrapped in burlap and everything is packaged inside a convenient box. Each of the nine figures is slightly different. Jimbot’s first Wood Robots are available from the Nerd City Booth (#750) for $90 each. Any remaining bots will be available from his site – jimbot.com after the convention. For this year’s C2E2 (4.25 – 4.27) comic convention in Chicago, Shawnimals is teaming up with the project management wizards at Basecamp. 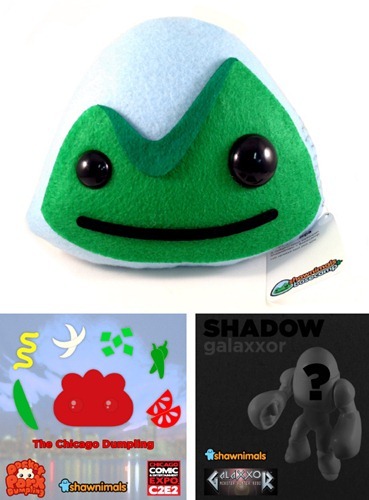 Shawn and crew will be offering a trio of exclusives including the handmade Happy Sherpa inspired by the Basecamp logo ($20). For those that prefer plastic, there’s the latest ‘con exclusive mini dumpling. The red hot Chicago Dumpling (50 pcs) will be available for $15. Finally, Shawn has put on his customizing hat and created a Shadow Galaxxor micro-run ($75) –- 5 customs of Ben Spencer’s futuristic Galaxxor resin. Find it all (including Resketch sketchbooks) at the Basecamp x Shawnimals booth [#655].